The Adriatic Sea. Photo by Katie Botkin. Fatma arrives shortly after 6:30 for our trip to the islands and Alex proclaims gleefully that we have time to get breakfast. He stops at a gas station on the way south, which surprises me slightly, but I think, OK, I can make do with gas station food. Apparently, however, gas station food in Italy is a bit different, because there’s a nice little bakery-café inside, where I eat the first sfogliatella of my life, along with a demitasse of excellent cappuccino. The sfogliatella is a multi-layered pastry shell filled with ricotta, and is mildly sweet. I wonder why I haven’t eaten these before — other than the fact that I’ve never seen them for sale anywhere that I remember. Then we continue our drive along the coast of the Adriatic for another hour, all the way to Termoli, where we buy tickets for the ferry to the archipelago of the Tremiti islands. 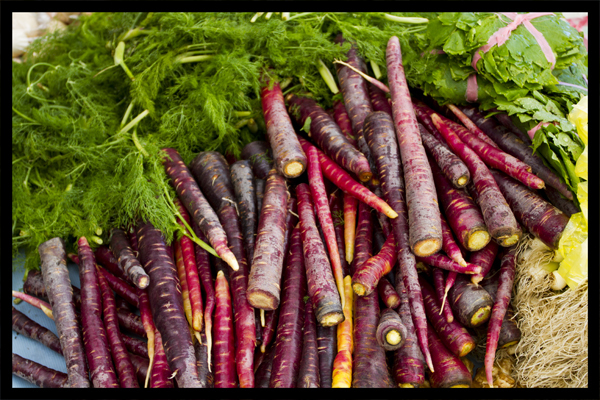 Red carrots, covered with fresh dill, at the Bodrum farmers' market. Even Sidar said he had never seen carrots like this. Photos by David Lansing. More about the farmers’ market in Bodrum yesterday: It was kind of like a moveable feast for me. I’d stop at one stall and buy a little bag of cherries, eating them while I walked around some more, and then maybe buy a few cashews, some plump dried apricots, a few olives, and even a peynirli börek (cheese pie). About those dried apricots: I don’t know what they do to them, but Turkish dried apricots are the best in the world. I fell in love with them in Istanbul and now buy them wherever I see them (and you see them a lot). Nuts, olives, and stuffed dried figs for sale at the Bodrum farmers' market. Photo by David Lansing. One of the other wonderful things I found at the market were dried figs stuffed with sesame seeds and almonds. They were being sold by this little old lady named Elif. As I got near her stand, she practically grabbed me by the arm to drag me over to taste her figs. To be honest with you, I took one just to be polite. But Elif knows her figs. These were incredible. And so I ended up buying a dozen of them. I think the trick is going to be making sure I don’t scarf them all down at one time back in my hotel room. They’re that good. 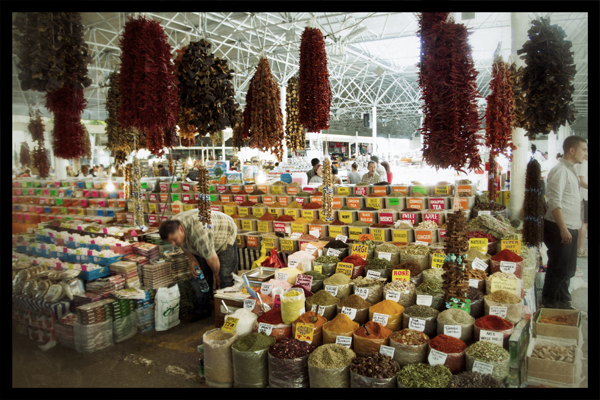 The Bodrum farmers' market on Fridays. Photos by David Lansing. My favorite thing to do, no matter where I am, is to go to the local farmers’ market. Everyone has one, right? And you see things there that you won’t see anywhere else. 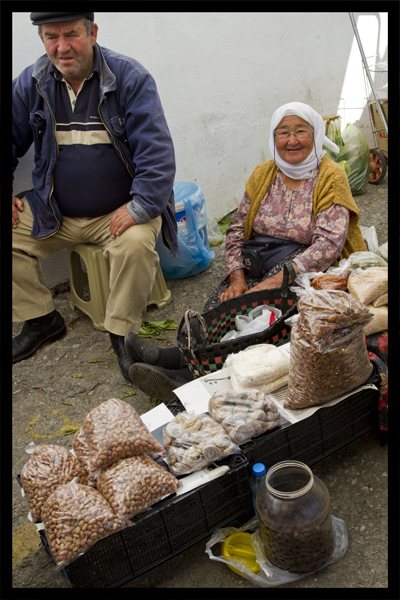 So this morning I asked Sidar if there was a farmers’ market somewhere around Bodrum and he said, Of course. This is how it goes with Sidar. He loves to yank my chain. An artichoke farmer at the Bodrum market explains the health benefits of enginars to me. Photo by David Lansing. So this afternoon, after lunch, we went to the farmers’ market which is held in a big covered building , sort of like an indoor parking garage, in downtown Bodrum. It was fantastic. The first thing that caught my attention was the guy selling small artichokes. They came with a foot or more of their stems and were piled stylishly in a mound. 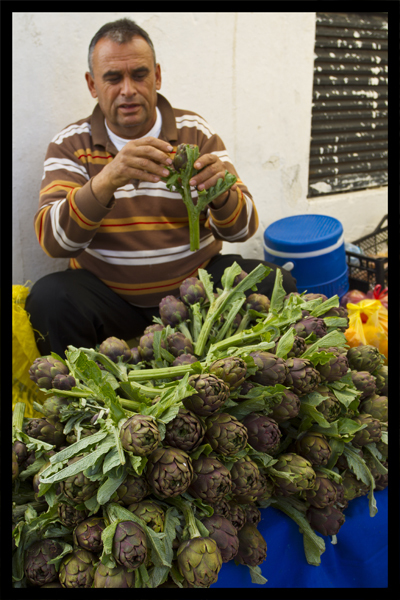 Using Sidar as a translator, I asked the farmer how Turks normally prepare artichokes. He said that they are usually poached in olive oil, sometimes with fava beans, almonds, and tomatoes, but with these artichokes, he would recommend slowly simmering them in water along with their stems and then drinking the soup. Very good for the kidneys and liver, he said. And also for other ailments. Like indigestion or ladies’ curse. Well, I don’t have to worry about that. But I thought it was an interesting way for the guy to market his purple-tinged artichokes (called enginars in Turkish)—as a holistic health cure. I could just imagine a sign in my local supermarket back home indicating that not only were artichokes on sale for a dollar a piece this week but if you made a broth from the stems, it might take care of your cramps. Just imagine. 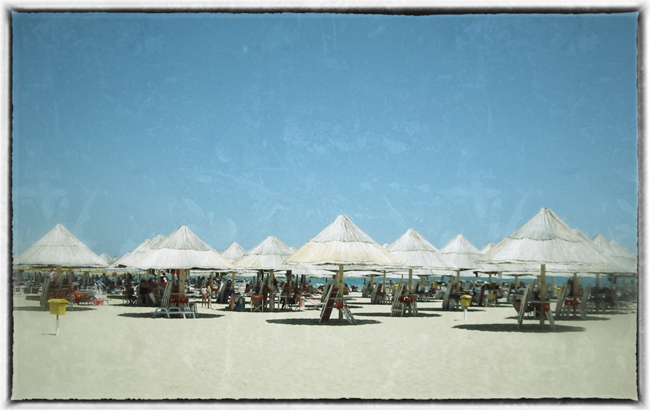 The beach at Pescara, Italy. Pescara is almost due east of Rome, on the Adriatic. I go by bus, and wait at the station for Alex, another person I’ve been corresponding with on Couchsurfing, a pilot for the Italian Navy — or Coastguard, depending on how you define his job. I’m not entirely sure what he looks like, because his profile photos are relatively small, but he recognizes me. He gives me a big hug like we’ve been friends for forever, puts my suitcase in his car, and shows me Pescara’s beaches, which are lined with umbrellas and Italian men in speedos playing volleyball, and we go in to have a little drink at his friend’s bar. “What are you having?” Alex asks me. I ask what he’s drinking. He tells me. “I like this girl,” Alex tells his friend. The drink turns out to be a semi-bitter cocktail made with ginsing, which we consume quickly, standing at the otherwise-deserted bar. Then Alex asks me if I want to go to a set of islands in the Adriatic tomorrow. I say yes. “We’ll have to get up early,” he tells me. I say no problem. We go to a dinner with his friend Fatma, a girl from Toulouse, who is coming with us, and get to bed shortly after 1 a.m. “See you in five minutes,” Alex says as he heads to his room. It doesn’t feel quite as short as that, but it’s still too early when Alex’s two alarms go off repeatedly at 6 a.m., loud enough for me to hear them and to decide to get up. 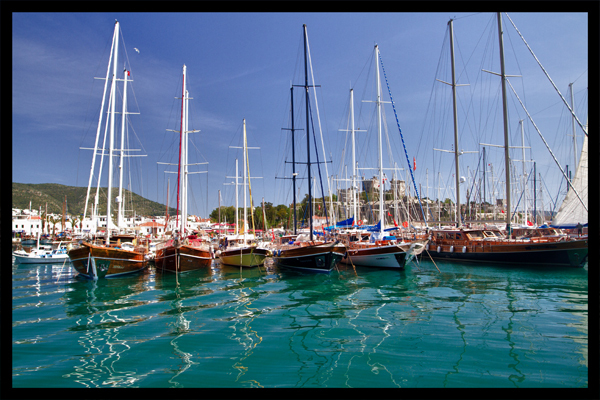 Turkish gulets in Bodrum harbor. Photos by David Lansing. 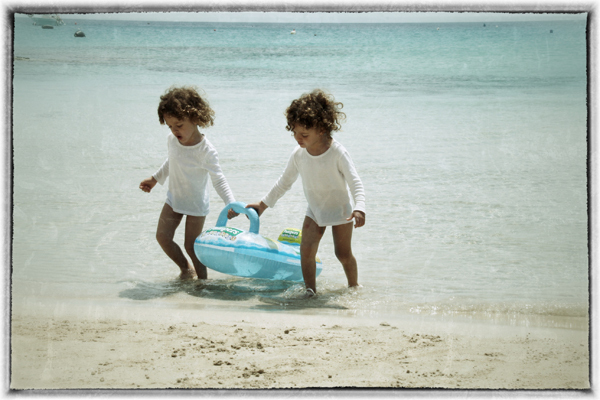 We did our own little blue cruise today aboard a beautiful gulet called Zeus. The yacht’s captain, Yorgo, is a friend of Sidar’s (Sidar has a lot of useful friends, right?). Actually Yorgo isn’t his real name. That would be Selahattin. But everyone calls him Captain Yorgo. Which is certainly a lot easier to say than Selahattin. Captain Yorgo, left, and Sidar on Zeus. Sidar always has a smile on his face--except when I take his picture. Then he prefers to look like a pirate. The Turkish gulets are beautiful boats. Originally built and used by fishermen and sponge divers in the Aegean, the classic gulet is a two-masted wooden sailing vessel with a rounded aft and low-to-the-water profile. 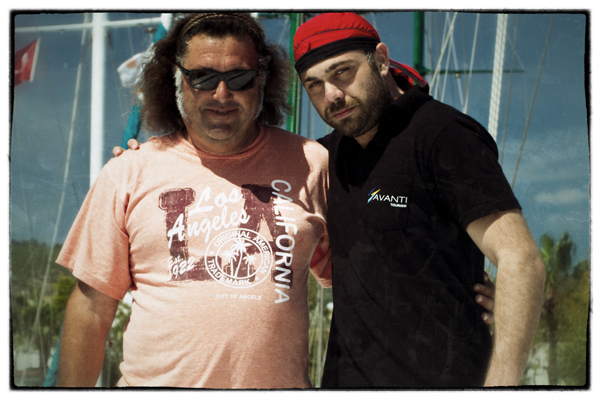 The fishing gulets Cevat Sakir wrote about in his book Blue Voyage were all powered by the wind. But these days most gulets (including the Zeus) are diesel powered. In fact, many of them aren’t even properly rigged for sailing anymore. As we slowly motored out of Bodrum harbor you could see dozens—maybe hundreds—of gulets. Almost all available for charter. Like us, some of them were heading out to cruise along the coast on a day cruise, everybody hoping to find a quiet little cove where they could throw down anchor and then spend the day sunning or swimming in the clear blue water. It made me think of what it must have been like back in the mid-20s and 30s when Sakir was cruising these same waters, under sail, with his friends, the Bodrum fishermen. Throwing lines out and passing the time by drinking a little raki, smoking harsh Turkish cigarettes, playing cards. It sounds so simple yet so exotic, doesn’t it?